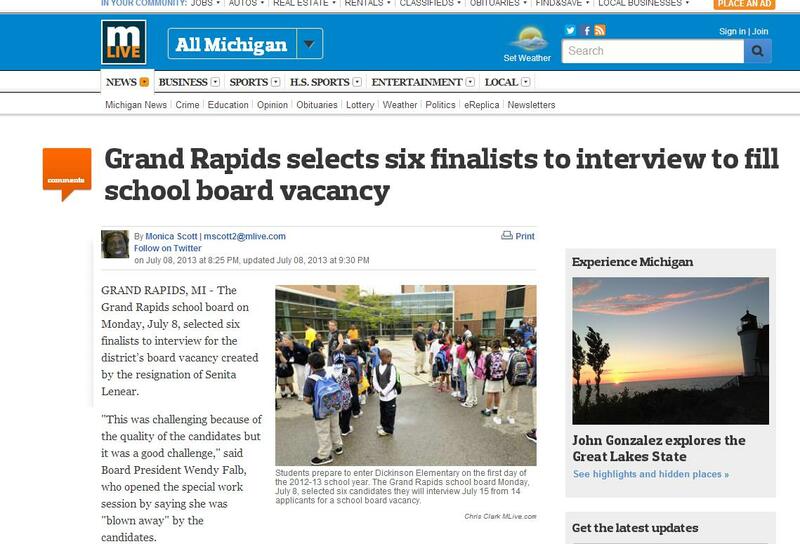 Monday, I had the amazing opportunity to be interviewed for the Grand Rapids Board of Education. I was one of six finalists selected for the public interviews. Ultimately, I was not chosen, but I was very thankful for the opportunity, and I left the interviews with an amazing sense of enthusiasm about how our community is banding together around students. I wanted to share a few thoughts with you that I distilled from my interview comments. I think the single biggest thing I offer the world, ultimately, is that I have substantial experience in being an innovator inside the “big box.” That is, I know how to think like an entrepreneur, read the market or environment, and act quickly and decisively, while interfacing with the complexities of a large, established organization. I’ve done this a number of times in my past, as an engineer, and I am doing this today innovating for kids with autism at Hope Network. In particular, my work there emphasizes mission-driven entrepreneurship in the non-profit sector. I think education could use more of this kind of thinking. Most public school systems are likewise large, mission-driven organizations in need of innovation. If they team up with people who know how to innovate within the “big box,” as they create game changing educational solutions, innovators can help them engage and captivate the public attention so that they get the community support they need to succeed. In truth, I’ve really never had a job where I didn’t have to collaborate on a team. I mean, in high school, when I bagged groceries at Family Fare, I was on a team with the other baggers and cashiers – we looked out for each other, flexed to help each other so no one had to shoulder too much work, and so on! I’m not sure I know what it means to go solo, or that it makes any sense in the modern world. I approach teams at three levels. On one level, I may be a subject matter expert on the team, and I advocate for evidence-based or evidence-informed practices based on my expertise. On another level, I learn from every team, and whenever I’ve participated on a team, I’ve surreptitiously become a minor expert in some topic on which I would never have spent time had I not been on that team. Finally, I think all team members should try and play a facilitative role for each other, to make sure views are heard, that expertise is shared, and that the team together is able to make informed decisions. That’s when a team becomes stronger, rather than weaker, than the sum of its parts. I think all of these things are important in many ways in the school setting. Collaboration between administrators and teachers. Collaboration amongst teachers. Collaboration among teachers, students, and families. And finally, community collaboration so that education extends far beyond the school walls. I think the biggest thing I try to do to promote diversity is to push everyone to understand how they bring diversity to the table and to think constructively about their own viewpoints, how they align or differ with those of others, and how they can be strengths or barriers. I listen to people, and I help them bring out their own unique view. I respect those views, even when they run contrary to mine, and I help them be the best “them,” rather than trying to make them into someone they are not. Personally, I feel this is a much better approach than trying to address diversity by demographic matching or telling some people they are “diverse” and other people they are “not diverse.” Some of this comes from the fact that Indian Americans are a relatively small group within the population. If Indian Americans were on this board in proportion to how many live in the city, I might never be “represented.” In my early career, I was provided mentors on several examples and I was always placed with a senior Indian or Indian American in the organization, without any attempt to understand me, my fit with that person, or how that relationship would contribute to my development. I don’t think that’s diversity. That’s pretend diversity. But if we encourage diversity in the broader sense, then we can have a real diversity and build a sustainably inclusive community. This is a process that can start very early – when I interviewed yesterday, I heard a really touching story from one of the other candidates about how she learned to be inclusive as a special needs preschooler (she’s now a very successful consultant). I didn’t learn inclusivity until much later. Think of what we could do and be if all our kids learned to be inclusive at three or four years of age. In interviewing for my school board, I did some thinking about why we care about institutions like public education. I believe passionately that what makes our society a great one is that we have invested for more than two hundred years in “technologies” and innovations that enhance freedom and liberty. We have never been happy to say we are “free enough” and hang our hats, and even as we talk today, we are engaged on many fronts as Americans in trying to make ours a freer state and nation. Public education is a great innovation because it makes people freer. There is hardly anything in the world that does more to free people than the work schools do. And thus, there is hardly anything more American than to stand beside schools, take up arms with them, and make the next generation and the next one after that freer and freer through the gift of knowledge through public education. These are just a few reflections I had on education, many of which I connect back to my approach to being an autrepreneur. I hope perhaps I fueled some thought processes of your own about how to bring education and innovation together. I don’t mean to pretend to know more than teachers, but I do feel that we entrepreneurs and autrepreneurs may have some things we can bring to the table. What do you think?